So, yesterday we left off with the number 15 Summer Essential, the French Bateau Top. Let's see how we fare with the remaining fifteen! As I mentioned yesterday, I don't own a lot of flats. However, I do have a that flat sandals covered. I've had this pair for a couple of seasons and don't plan to part with them anytime soon. Great for all looks! My assumption is that this trouser isn't made of wool or paired with a suit. A cropped version in cotton, or some sort of blend, that is a little slouchy in design could work. I'm thinking my hot pink H&M pants fit the bill. Who doesn't love to party? Although, I didn't know I needed a top to do so. Something that dons sequins, a fun print, is of drapey fabric and isn't suitable for the office will do. This one has thrown me for a loop. Based on the photos, I'm thinking my retro Ray-Bans will do. You know, the ones everyone wore in the mid 90s? And yes, I still have mine! I've purchased these as gifts, but I don't actually own one myself. However, my mom still has all the ones I made her in grade school. I'm pretty sure I've got this covered as well. You've seen my shoe collection, right? I have several, but the best one I own is from Target. 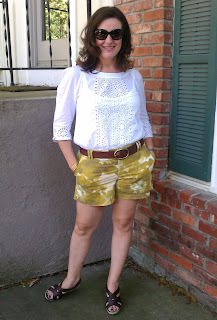 And, I just wore it over the weekend with cropped, relaxed khaki's, a Bateau top and Flat Neutral sandals. Wow, three essentials in one outfit! 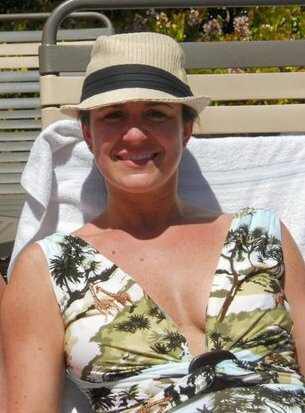 I don't actually own a Panama hat, but I do own plenty of other styles. Probably won't make the list. Again, I've got this covered. I have a fav pair from Banana Republic that I bought ages ago. A crystal chandelier earring that I've worn with pretty much everything! I own several different versions and wore my Converse tennies while in Chicago. I don't think the white sneaker will ever go out of style. I mean, how long have they been making white Keds? I don't own one of these either, but if you check out my Pinterest page, I have the bracelet version down as a DIY I would love to tackle. Pretty sure I can add the necklace to list DIY list as well. I blogged about this earlier in the spring. A neon crossbody-bag would be a fun accessory to add. Target has some darling versions out now! I wear mine all the time! Just a perfect piece for any look. It adds color or just completes the outfit. Everyone should have a printed scarf in the wardrobe. Well, that's it! The 30 Summer Essentials. How did you do? I think I'm looking pretty good as far as summer is concerned. However, that doesn't mean I won't be shopping. That would be absurd! *The winner of the Ann Taylor Giveaway has been notified via email! I recently received an article from Refinery 29 informing the masses of the top 30 Summer Essentials. I immediately dove in, wondering if I had any, or all, items in my closet. Surprisingly, I'm missing a few. Now, do I purchase or just let those go? A two part series, here are the first 15! This is a definite that I preach about all the time! And, it just so happens, I own plenty! If you only purchase one, make it black! You can pair just about anything with it and it will never go out of style! I have a couple, one in white the other in black, and they are great for the summer heat. You can pick them up pretty much anywhere, but I do love my black one from the Gap. This is something I haven't own in years! I think I got burnt out from all the ones I owned when I worked at Harold's. Probably a fad I will skip. Do you currently own one? Another item I don't own. I am not a huge fan of linen, only because it wrinkles. But, I do have to say, that linen pants are on my radar. Yes, they too wrinkle, but they are so easy and comfortable! A double bonus. Yet another piece that hasn't donned my closet since the mid 90s. I just can't get past the early 90210 looks that I tried to rock in my mid 20s. Definitely not going to make the cut! According to this article, modern sundresses come in python inspired prints, have peplum waists and are much more structured than the free flowing dresses of yore. I recently purchased a Milly sundress that appears to meet the above requirements. I will keep you posted! Yes and Yes! I love mine and will continue to rock them in both boot cut and skinny! This would be an ideal bag for a quick getaway. Perfect for throwing in a bathing suit, cover up, hat, sunglasses, suntan lotion and lip balm. Granted most of us live in the middle of the country where water is merely a public pool away, but we can day dream right? And yes, I have one of these too! I live in sweaters all year long. So you can bet I have a summer knit. A loose weave sweater that is perfect over tanks, a swimsuit or tied at the waist for that just in case chill on an early summer evening. A definite essential! I for one am not much of a shorts girl. I hate my legs, so when I do wear shorts, its rarely photographed. 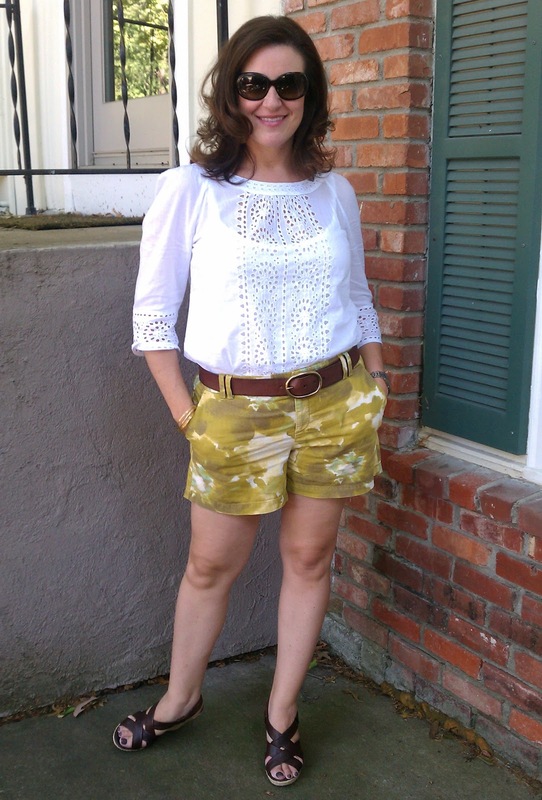 However, I do have those adorable floral shorts from Anthropologie, but not sure they are what Refinery 29 refers to as a "city short". 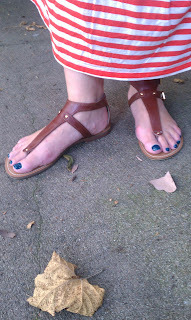 I have my electric blue pair from Ann Taylor and wore them on our trip, twice! Again, photos were never captured which makes both looks fair game in the future. It may be a trend, but one you should definitely invest in and soon! Since I don't own a lot of flats, I definitely don't pointed toe flats. And, probably never will. This I do own, but haven't worn since our time in Vegas a couple of years ago. 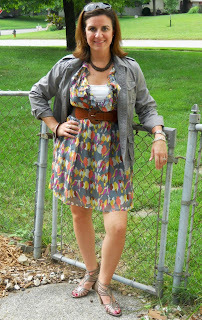 It sports a plunging neckline, jungle motif and a cute belt with wooden buckle! I love it, but haven't a clue when and where I will wear it again. Maybe in the backyard in McKinley's crab pool! According to Refinery 29, "the striped tee is like the secret sauce in a good wardrobe". Well, my wardrobe must be super spicy as I own entirely too many of said top! But, I love each and every one. Okay, that's the first 15! How are you doing so far? 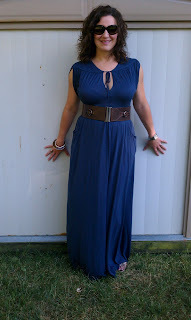 Need a wardrobe fix or are you doing as well as I am right now? Check back tomorrow for the remaining 15! It happened again! A completely different outfit than what I had planned in my head. But, I love this outfit more than the one planned! So great when that happens! I am a huge fan of this top. Love the flow, the color, the length...everything! And, how fun are the lime shoes with the neon yellow? (I packed a pair of black just in case I didn't like them in natural light.) And, I added a ton of sparkle! Layer after of layer of bling makes a girl giddy! I love a turtleneck! No matter what time of year, I wear them. I have them in merino wool, cashmere, silk, cotton, sleeveless, short and long sleeved. 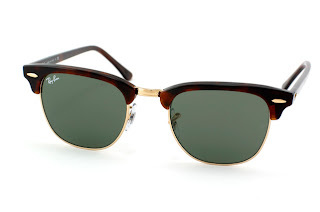 And, because of the variety, they can be worn/paired with anything! Take this little white t-neck for example. It's light weight cotton, sleeveless and perfect under the denim jacket. I've worn its sister, or brother, in black with a scarf seen here. And let's talk about this work-horse of a denim jacket, shall we? I purchased this for our trip to Chicago and I've worn it numerous times already and I haven't even had it a month! 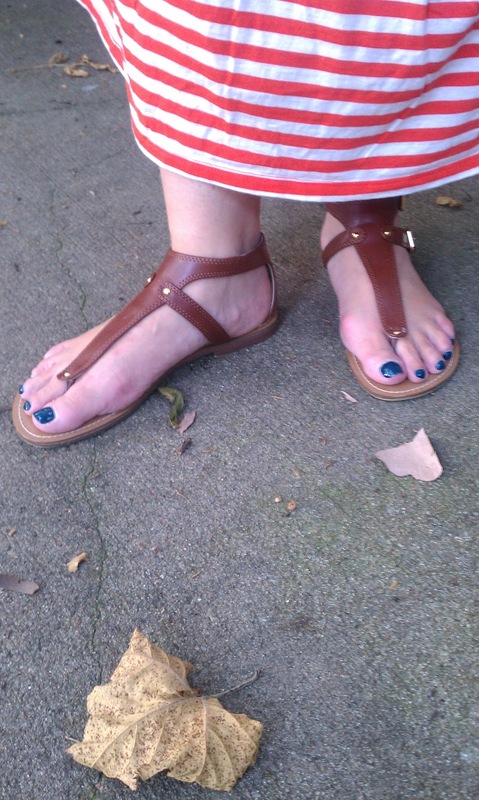 And how cool are these new sandals! They were the inspiration around the look! You gotta love purchasing a shoe and then finding something to wear with them! 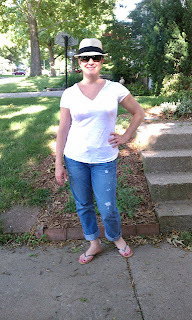 I love wide leg jeans and these rock! I took a page from Rachel Zoe, however they look ten times better on her! I will have to attempt this look next time I wear mine. Totally chic! 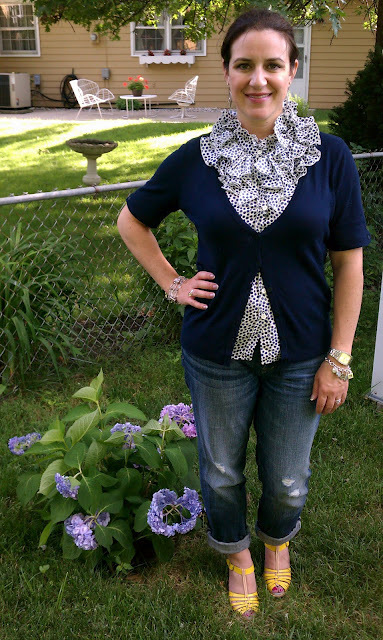 I decided to pair mine with a tie front blouse, leaving the tie undone for a breezier look. I didn't want to go too stuffy and tying the tie would make this a little more conservative. I added a belt to keep the volume down since the jeans have enough in the leg. 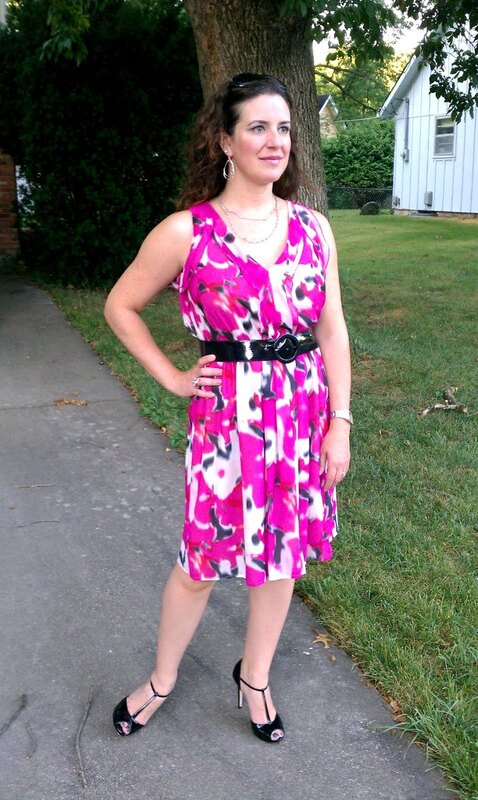 What you can't see are my amazing Brian Atwood pumps! I've worn them here and the last time I wore these jeans. However, a photo was never taken so that just means its a do-over with that look! And the Starbucks in my hand, that had nothing to do with the photo below! Just a sheer coincidence! Would you go with jeans with such wide legs or just keep it to flares? Photo of Rachel Zoe courtesy of Your Next Jeans. 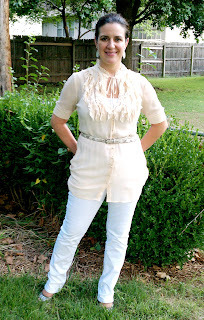 Win this Ann Taylor Necklace! 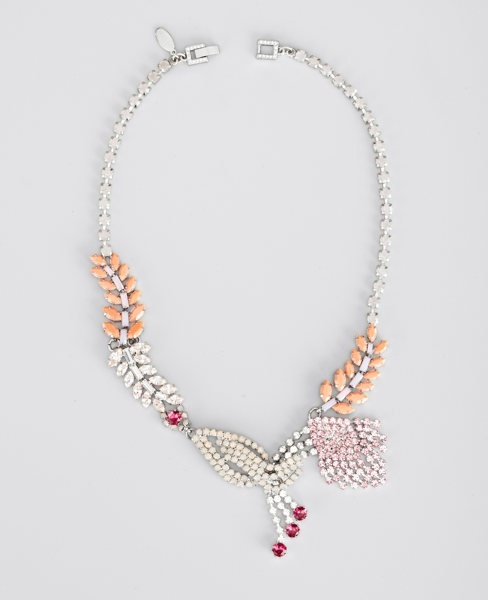 Win this fabulous Vibrant Vine Necklace from Ann Taylor! I am super excited to host my first giveaway! And, so happy to be working with one of my favorite retailers, Ann Taylor! See details below on how to make this piece yours! 1) Leave your name and a comment below on how you would style the necklace. 2) "Like" Ann Taylor on Facebook. That's it! Check back next week for the winner! The giveaway is open until Tuesday May 29th at 10:00 p.m. Giveaway open to U.S. residents only. Yesterday was definitely a "fat" day for me! As in, I feel so fat that I need something to wear that will hide it! BINGO! This full skirt did the trick, however in the before and after photos below, I appear thinner after baby than I do less than a year AFTER the photo was taken. Thank goodness Zumba starts in two weeks! It is time for this mommy to get herself back in the gym! This dress, with its busy print, is really easy to style. Add a belt, a statement necklace and you are ready to go! 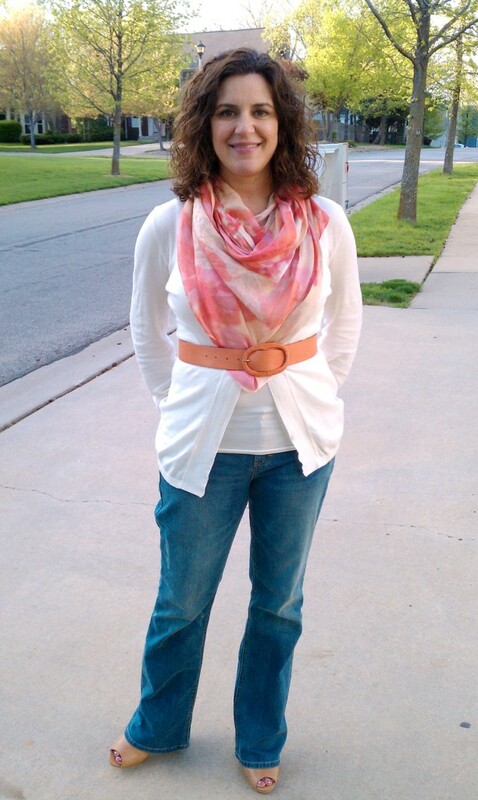 I love when getting dressed is this simple! And, who needs this sock bun that everyone is talking about! I just put my hair in a ponytail, sectioned off the ponytail in four parts and then rolled each part under and pinned. Made for a nice full bun without the added accessory! Loved the polished looked. How I wore the dress before. Giving it a twirl, I attempted to make the skirt do just that. It was fun to try at least! What started out as a simple six question email to Jessica Quirk, author of the blog (and book) What I Wore, turned into something so much more! After her responses arrived, I informed Jessica that I would like to add a couple of photos from the early days of her blog, May 2007 to be exact, as well as current photos so that readers could see how her style had evolved over the years while still staying very much the same. She was happy to oblige, providing her Flickr account, and from there this post took flight! Things took a new route when I found myself focused on three simple pieces that exist in Jessica's wardrobe. A vintage dress that was her first expensive piece, around $100. 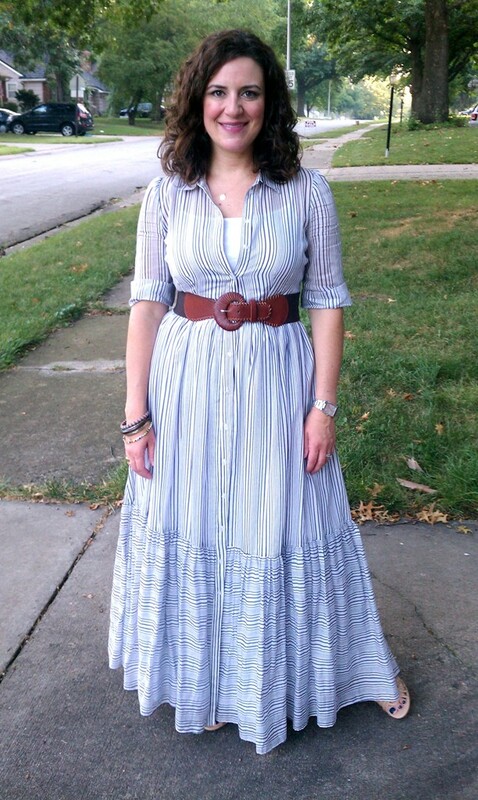 An Oaxacan dress which just happened to be her first What I Wore photo*. And a leopard coat, also vintage, that she claims "is the one thing in my closet I'd grab if my house was on fire (if my husband, cats, computer and cameras were already out)." As you read, you will not only find questions and answers, you will find a blogger whom I admire and refer to as my online mentor. No, she doesn't really mentor me, but she does provide inspiration with sewing ideas, DIY projects and in her daily photos. I can't pose like her, but she has helped me in trying not to feel so self-conscious about the way I try to add new poses for my own blog. And though we aren't friends on a personal level, I feel that she is very down to earth not only in personality but in how she approaches style. So, without further ado, I introduce you to Jessica Quirk. Style My Way (SMW): For me, I was inspired to start my blog based on a Metropolitan Museum of Art’s American Woman: Fashioning a National Identity exhibit. I felt we as a society had lost our ability to "dress" on a daily basis. What inspired you to start "What I Wore" and what keeps you inspired to blog every day? 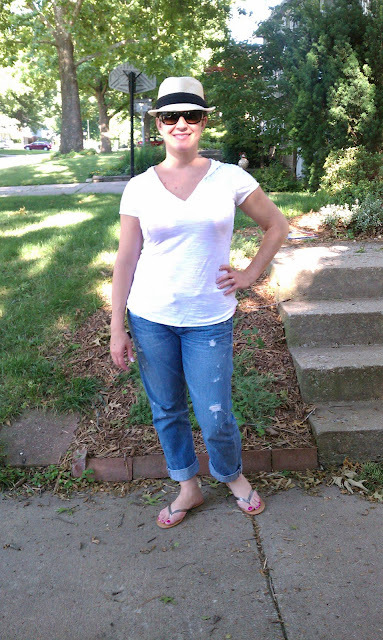 Jessica Quirk (JQ): I started the blog as a place to elaborate on my daily outfit photos, which I started taking a year before What I Wore was up and running (in 2007!). I keep it up partially for selfish reasons - it's a great way to remember what happened at a specific time in my life or a phase I was really into. It challenges me to shop my closet and wear old things in new ways too. I also do it because I think there's a large group of women who are interested in looking good each day, but aren't going to go shopping every time a new trend hits the floor. My goal with What I Wore is to be inspiring, informative and relatable. SMW: I am drawn to bloggers that write about things that I too am passionate about such as fashion, travel and entertaining. What draws you to other blogs? And, what keeps you coming back daily? JQ: I like reading blogs that are relatable with authors that feel like close friends. I'm also a very visual person so pretty blogs with great layout and design catch my eye too. Some of my favorite sites DesignforMankind.com, KendiEveryday.com, Frecklewonder.com, Blog.MrsLillian.com, and SFgirlbyBay.com (plus all of the sites on my blog roll). SMW: I have been blogging for three years, but still consider my blog a very amateur endeavor. When did you know it was time to make your blog a full time job? What helped you make that move? JQ: When I lived in NYC, I had a great meeting with the found of tumblr, David Karp who introduced me to Suzanne Xie and Rich Tong, founders of Weardrobe, a personal style social media site (which was eventually sold to Google). When I told Rich about my traffic, he suggested I start working with advertisers. A few months later, with a handful of sponsor partners, I quit my job and made What I Wore my full time endeavor! SMW: If I didn't have to go into work everyday, I'm pretty sure I would lay around all day watching TV! Because you don't work in a traditional office environment, what motivates you to "go into the office"? How do you keep yourself from loafing around all day and losing focus on your blog? JQ: Honestly, I'd feel like a fraud of I just got dressed up each day to sit around the house. I like having a routine and part of that is getting up, getting ready and out the door each morning. Most week days I work in the morning at the office on my laptop and then use the afternoons for sewing or DIY projects. I also have a rough outline in my mind about what I need to accomplish each day and I like to work ahead if possible. It's always my goal to have a post Monday-Friday. SMW: Since starting my blog, I've discovered that I love to write, share personal stories and put myself on display more than I ever thought I would. But, I struggle with thoughts of my friends thinking I'm taking myself too seriously and/or thinking I'm something more than I actually am. Did you ever have second thoughts about yourself as a blogger or did you just know this was a good fit? JQ: No way! I love sharing, and blogging is a great outlet for me. It was also helpful that when I started my blog there was a big group of tumblr bloggers in NYC who would get together socially, so it's never felt weird for me. Incidentally, What I Wore was the first personal style blog I read and it continues to be a daily read. If you want to continue to explore the world of Jessica Quirk, she has a new little blog idea up her sleeve, check her out here! *All photos on What I Wore taken by Adam and Jessica Quirk.